Citing threats associated with climate change, the National Oceanic and Atmospheric Administration (“NOAA”) proposed on December 7, 2012 to list 66 coral species under the Endangered Species Act (“ESA”), and to reclassify two already-listed Caribbean coral species from “threatened” to “endangered.” According to NOAA Fisheries, this was “the most complex listing process NOAA has ever undertaken.” NOAA’s coral listing proposal is monumental for several reasons, including the scope of the scientific review, the unprecedented application of the ESA to marine invertebrates, and the federal government’s continued recognition of the adverse impacts of climate change on marine species. If finalized, the coral listings could provide significant tools for marine conservation and climate adaptation. This post begins with quick facts about corals, followed by a review of the process that led to the proposed coral listings; a brief summary of the proposal; the reasons why these proposed listings are particularly monumental; and a discussion of what the listings might mean for corals, marine conservation, and climate change adaptation. Coral reefs have existed for 240 million years, although they have suffered several mass extinctions over that period. The process of constructing a reef can take centuries or even millennia. Coral reefs are the most biodiverse ecosystems on the planet. Corals provide habitat, food, and shelter for one-quarter to one-third of all marine species even though they cover less than one percent of the seafloor. Coral reefs provide many essential ecosystem services to humans, including: sand production, nutrient recycling, fishery habitat, tourism, medicines, and protection from storms. In fact, the monetary value of the goods and services provided by corals is estimated at $170 billion to $375 billion per year. Notably, all coral species named in the Center’s petition are already designated as threatened by the International Union for Conservation of Nature (“IUCN”) and protected under the Convention on International Trade in Endangered Species (“CITES”), a voluntary international agreement signed by almost all countries—including the United States—to prevent the cross-border trade of endangered and threatened species. In February 2010, NOAA made a so-called “90-day finding,” agreeing to review the status of 82 of the 83 candidate coral species included in the Center for Biological Diversity’s petition. NOAA established a Biological Review Team (i.e., a group of federal government scientists with expertise in corals) to compile the best available scientific and commercial data in order to evaluate the extinction risk each candidate species faces. Progress stalled, however. The Center for Biological Diversity filed three notices of intent to sue the agency. Finally, in 2011, as part of a stipulated settlement agreement approved by the federal District Court for the Northern District of California, NOAA agreed to submit a proposal regarding the 82 coral species by the end of 2012. In April 2012, the Biological Review Team finally released a Status Review Report, which concluded that most of the evaluated species were “more likely than not” to go extinct by 2100 as a result of climate change impacts, barring any dramatic shifts in policy or technology. On November 30th, in compliance with the court-ordered deadline, and based on the Status Review Report, NOAA announced its proposed decision to list 66 coral species and to reclassify elkhorn and staghorn corals from “threatened” to “endangered.” (NOAA found that listing was not warranted for the other 16 coral species.) The full proposal was published on December 7th at 50 C.F.R. pts. 223 & 224. Of the 66 coral species proposed for ESA protections, 59 are located in the Pacific Ocean (off the coasts of Hawaii, Guam, the Northern Mariana Islands, American Samoa, and U.S. Pacific Island Remote Area) and 7 are located in the Atlantic/Caribbean Ocean (off the coasts of Florida, Puerto Rico, Navassa, and the U.S. Virgin Islands). The species can also be found in 83 other countries. Twelve species would be listed as endangered, and 54 would be listed as threatened. The full list of corals proposed for ESA listing can be found on the NOAA Fisheries website. In its proposal, NOAA identified 19 threats to corals, including ocean acidification and coral bleaching. Ocean acidification is a phenomenon resulting from the ocean’s absorption of atmospheric carbon dioxide (CO2). Each year, the ocean absorbs an estimated one-quarter of the CO2 we emit into the atmosphere from activities like driving a car. This absorption leads to shifts in the ocean’s chemical balance that cause the ocean to grow less alkaline (from pH 8.2 to 8.1). Yes, this can also be phrased as “more acidic” but it will be a long time before seawater can be classified as an acid with a pH below 7. Strikingly, the acidity of the ocean has increased by approximately 30 percent since the Industrial Revolution, and the ocean is predicted to be 150 percent more acidic by 2100. A more acidic ocean, with a higher concentration of free hydrogen ions (H+), means a shift from solid calcium carbonate (CaCO3) in favor of dissolved bicarbonate (HCO3–). Calcium carbonate is an essential building block for the skeletons and shells of many marine organisms at the base of the food chain (e.g., oysters, clams, corals, and some plankton). The decreased carbonate (CO32-) availability stresses calcifying organisms, making them more vulnerable to other stressors and endangering the entire marine food web. Coral bleaching increases the frequency and severity of coral disease outbreaks. As the temperature of the ocean rises, corals become stressed and expel the symbiotic algae living in their tissues. 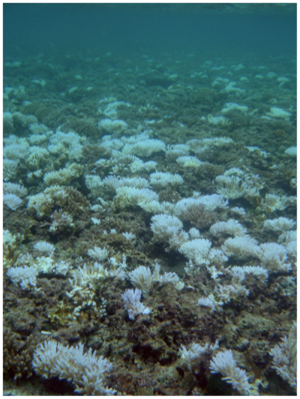 The algae expulsion causes the coral to turn white and appear “bleached.” Bleached corals are not dead, but they are severely weakened and more susceptible to death. You may recall the major coral bleaching event that occurred in 2005, when the United States lost half of its Caribbean coral reef population. On a large scale, bleaching can result in fishery and ecosystem collapses. 1) Invertebrate species like corals historically have received little attention under the ESA. Prior to the Center for Biological Diversity’s petition, the possibility of listing numerous corals under the ESA was barely on NOAA’s radar. Of the 82 candidate coral species, only one species (Montipora dilatata) was even previously identified by NOAA Fisheries as a Species of Concern (“Species of Concern” is an ESA designation given to species about which federal agencies have some concerns, but more data is needed about the species’ status and threats to support a listing). Invertebrates generally, and marine invertebrates in particular, receive comparatively little conservation attention. Indeed, out of the more than 1.2 million invertebrate species that exist on the planet (insects, spiders, shellfish, crabs, octopus, snails, etc. ), only 226 species are listed as threatened or endangered under the ESA (or <0.02 percent). In comparison, 393 of the 50,000 or so known vertebrate species are listed (about 2 percent). Put another way, vertebrates receive more than one hundred times the protection invertebrates receive. Although vertebrates comprise only about 3 percent of the earth’s species, they represent a whopping 64 percent of ESA listings. It is not terribly surprising that vertebrates are listed in disproportionately larger numbers than invertebrates like corals. Furry, big-eyed, “megafauna” (think Pandas) tend to capture the public’s imagination more than gooey, prickly, spineless things (do you even know what an arthropod is? Hint: they make up three-quarters of all animals on the planet.). Although the ESA “Definitions” section explicitly states that the Act applies to any “mollusk, crustacean, arthropod or other invertebrate,” it is clear from the structure of the Act that the Act is an easier fit for terrestrial vertebrates like bald eagles and grizzly bears than corals. The proposed coral listings represent a dramatic and unprecedented increase in attention to invertebrate conservation. In fact, if NOAA ultimately decides to list all 66 coral species, the total number of ESA-listed invertebrates will increase by a third. And because only 4 marine invertebrate species are currently protected under the ESA (elkhorn and staghorn corals plus 2 abalone species), the total number of ESA-listed marine invertebrates will increase almost 2000 percent. In other words, NOAA’s proposal is big news for marine invertebrate conservation. 2) The corals are the latest example in a growing trend of climate-imperiled species listings. NOAA’s proposal is also big news for climate-imperiled species conservation. Few species currently are protected under the ESA because of climate change impacts. Two of those species are elkhorn and staghorn corals—further noteworthy because they are the only two coral species currently listed under the ESA. Elkhorn and staghorn corals were the first species to gain ESA protections based on global warming impacts. Another climate-imperiled listed species is the polar bear, which was listed as threatened in 2008 due to its shrinking sea-ice habitat. Notably, the polar bear, elkhorn, and staghorn listings are also examples of successful Center for Biological Diversity petitions (see here, here and here) and ensuing legal battles. In the cases of several other listed species, such as some Florida butterfly species, the atlantic sturgeon, and the loggerhead sea turtle, federal agencies named climate change and/or sea-level rise as a factor contributing to the listing. There are likely additional examples. Overall the number of species listed explicitly because of climate change is still a small, but growing. The listing trend suggests that greater numbers of climate-imperiled species may become candidates for ESA protections in the coming years. Providing species with domestic legal protections based on the global problem of climate change is a significant policy trend for the United States, especially when contrasted with the federal government’s failure to enact greenhouse gas emission mitigation laws in response to the same global challenges. It should be further noted that, to date, comparatively few terrestrial climate-imperiled species have yet received ESA attention (polar bears are classified as marine mammals); but this may change as terrestrial climate change impacts grow more dramatic and are increasingly documented. 3) The scope and complexity of the scientific review was exceptional. NOAA’s status review of 82 coral species is by far the largest, most complex review NOAA has ever undertaken. The second largest species review took place in the 1990s, when NOAA’s Biological Review Teams reviewed the status of all West Coast anadromous salmon species—representing 30 total species. The salmon review resulted in NOAA listing 24 additional salmon and steelhead trout populations under the ESA, but even that massive effort pales in comparison to NOAA’s current proposal to list almost three times as many coral species. NOAA’s coral species review is unprecedented not only because of its scope but also because of the distinct challenges involved in assessing the abundance of a species (i.e., the total number of species in a given area) when the species is both clonal and colonial. Coral are clonal, meaning they can reproduce asexually by splitting into fragments, each of which develops into a clone of the original coral. Coral are also colonial, meaning they build colonies through reproduction. A coral colony can survive even if a portion of the colony dies. Deciding how to measure coral abundance thus presented the Review Team with some challenging questions. For the purposes of determining abundance, are genetically identical corals “distinct” individuals? Or is an entire coral colony better understood as an individual? Identification was complicated by the fact that, even if a coral species can be identified on the ground, it is often difficult to distinguish between separate coral colonies. Partially as a result of these complications, and further compounded by the fact that corals have complex life-cycles that are difficult to monitor in marine environments, abundance baseline and trend data essentially was non-existent for most of the corals NOAA examined (see Status Review Report at p. xxxiii). As NOAA noted in its proposed rule (pp. 17-18), abundance estimates only existed for a few of the 82 candidate coral species, and much of the abundance data NOAA could obtain evaluated coral cover only at the genus (versus species) level. NOAA therefore had to evaluate corals’ extinction risk against a backdrop of high scientific uncertainty. (For an account of how NOAA managed to calculate coral abundance given various scientific and practical limitations, see Status Review Report at chs. 2.1, 6-7). The resulting proposal is thus a significant example of agency decision-making against the backdrop of a high level of scientific uncertainty. Notably, this is exactly the type of decision-making that will be increasingly required in a climate-impacted world. Given that climate change impacts are only predicted to increase, combined with the fact that climate change impacts are sweeping and broadly impact all species and ecosystems, it is likely that federal agencies will continue to face similar review challenges. NOAA’s coral review likely is only the first of many large-scale ESA reviews that federal agencies will be required to undertake in a climate-impacted world. Like the coral review, future climate-impacted species reviews may also concern species for which we have little baseline abundance data, which have received comparatively little scientific attention in the past, and which may not be easy fits for ESA procedures as currently applied and interpreted. Before discussing the proposal’s broader potential impacts, it is helpful to review the next steps in the listing process. Before making a final listing determination, NOAA will seek comments on its proposal from the public (e.g., scientists, industry, and any other concerned parties) and other government agencies. (You can submit written comments online via www.regulations.gov, entering the code: NOAA-NMFS-2010-0036). NOAA plans to finalize the listings by December 2013. Once a species is listed, the ESA allows NOAA to designate certain geographical areas that are essential to the species’ conservation as critical habitat, and identify regulations necessary for the species’ conservation. NOAA also may develop a recovery plan to put the listed species on the path to recovery. NOAA additionally is required to consult with other agencies whose actions may jeopardize the species’ existence; before another federal agency can take any action that may adversely affect a listed species, such as issuing a permit or authorizing funding, ESA § 7 requires the agency to obtain a biological opinion that such action is “not likely to jeopardize the continued existence of any threatened or endangered species or result in the destruction or adverse modification of designated critical habitat.” Additionally, NOAA may issue permits for activities that might incidentally cause a take of an endangered species (under the ESA § 9, taking means “”to harass, harm, pursue, hunt, shoot, wound, kill, trap, capture, or collect, or to attempt to engage in any such conduct.”) Commercial activity involving an endangered species is forbidden, and NOAA may extend these protections to threatened species, as well. If the 66 coral species are listed, what could we expect? 1) Critical habitat designations for the corals could be very large. If the critical habitat designated for the other three climate-imperiled marine species already listed under the ESA is any indication, critical habitat designations for 66 coral species could amount to thousands or even tens of thousands of square miles of ocean. The polar bear listing coincided with the largest critical habitat designation in history: 187,000 square miles of Alaska are protected. Elkhorn and staghorn corals benefit from a smaller, but still significant critical habitat designation of 3000 square miles of marine habitat. Still, in combination with the ESA’s section 7 “jeopardy” clause, any coral critical habitat designations could be quite powerful. Which brings us to the next point…. So far, elkhorn and staghorn corals’ critical habitat has not presented notable controversies; but, as Kelly suggests, this is most likely because federal agencies “have not yet appreciated that they are subject to the requirement.” In the future, marine conservation advocates could harness critical coral habitat as a tool to obtain additional protections for marine and coastal environments. 3) NOAA’s traditional interpretation of “take” may be challenged. Kelly notes that the larvae of marine invertebrates present some interesting questions in the context of ESA “take” provisions: “[B]ecause each adult animal may produce billions of nearly microscopic, translucent larvae that float for hundreds or thousands of kilometers . . . . could a person be subject to civil and criminal penalties for unwittingly killing a handful of nearly invisible larvae during a day at the beach?” Kelly recognizes this as an extreme hypothetical; but the underlying tension remains: ESA “take” prohibitions are an uneasy fit for corals. If the 66 coral species are listed, NOAA ultimately may enact regulations specific to their protection. As NOAA continues to list greater numbers of climate-imperiled marine animals under the ESA, it will be interesting to see how all of these challenges play out. In the meantime, National Geographic has posted beautiful photos of some of the candidate corals. We can be grateful that the devastating effects of ocean acidification and coral bleaching are receiving increased regulatory attention.